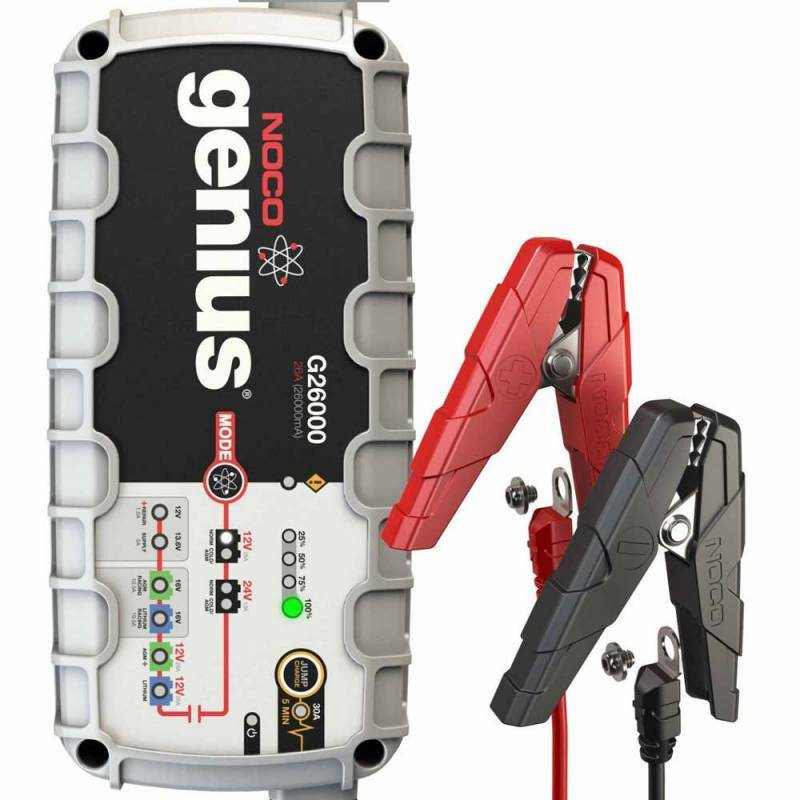 The G26000 Pro-Series UltraSafe Smart Battery Charger is perfect for charging cars, boats, RVs, trucks, tractors and more. Extremely effective for maintaining automotive, marine, RV and deep-cycle batteries. A professional-grade charger for those that demand maximum performance - outperforming ordinary chargers by 2X. 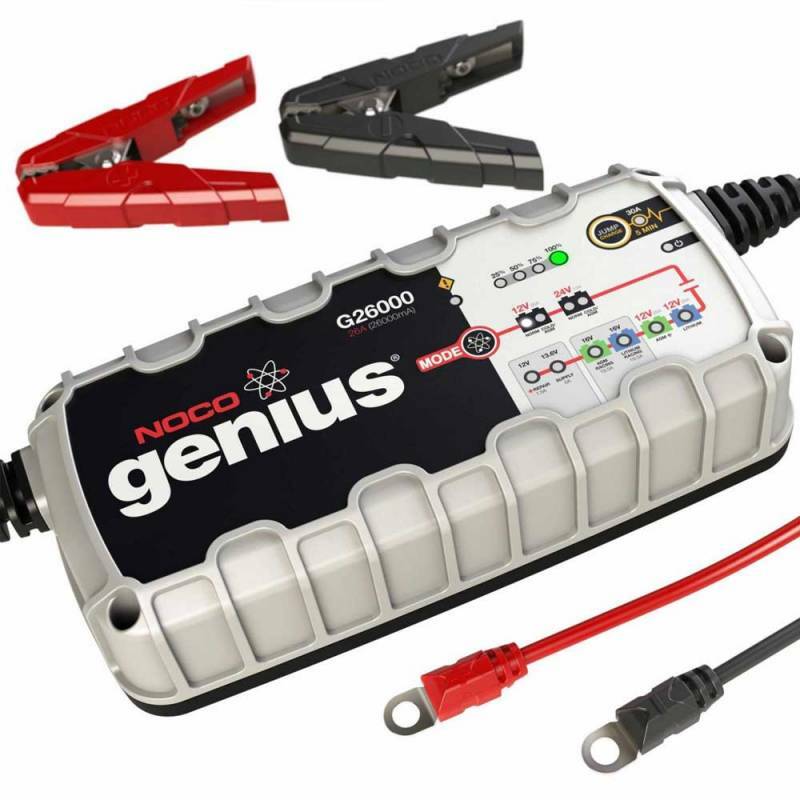 Without NOCO Genius, you would have to buy a different charger for standard 12V charging, AGM batteries, cold conditions, 6V batteries and lithium batteries. With a simple push of the mode button, you have the power to switch between any of those modes with one charger. Even better, the charger will remember the last mode you were in every time you reconnect, allowing you to simply set the mode once and never have to worry about it again. For charging 16-volt lithium-ion batteries, including lithium iron phosphate, which are commonly used in racing vehicles. Overcharging your battery is one of the easiest ways to reduce the expected lifespan of your battery. So we designed in multiple levels of intelligence to monitor battery activity to activate and disengage charging as needed. This allows for incredibly safe charging and worry-free operation year round (24/7/365) without ever disconnecting from the battery. Accidentally leave your lights on? Then you might need a charger to fully recharge your battery. 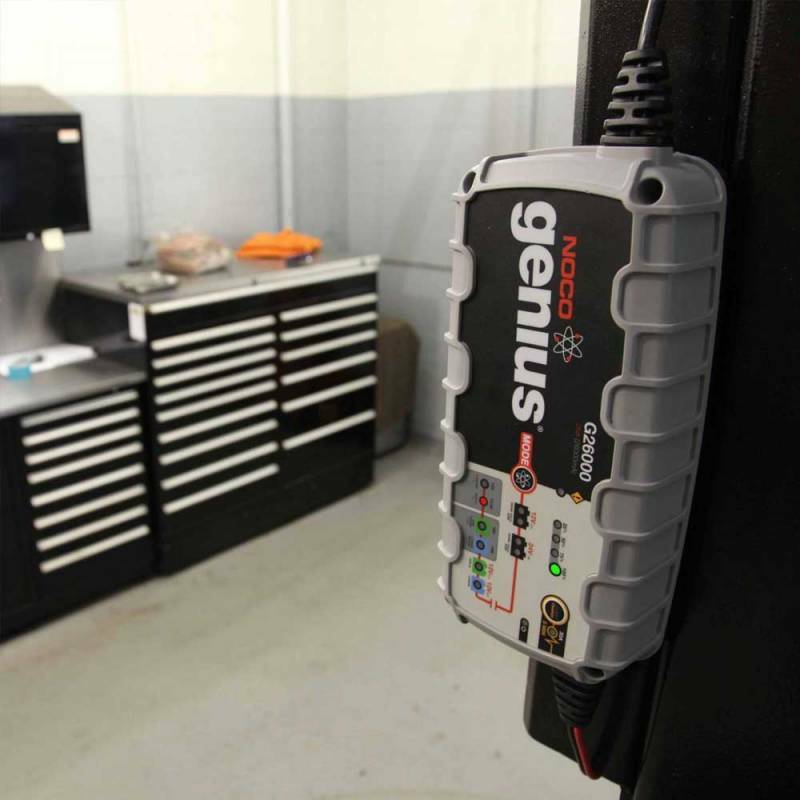 Charging times are one of the biggest difference between the Genius Charger models. Every model has NOCO's advanced smart charging technology, but the bigger the model, the higher the power. A fully drained battery is extremely rare under normal vehicle use. Maintenance is keeping a battery fully charged, removing and preventing sulfation, and simply keeping the battery healthy. 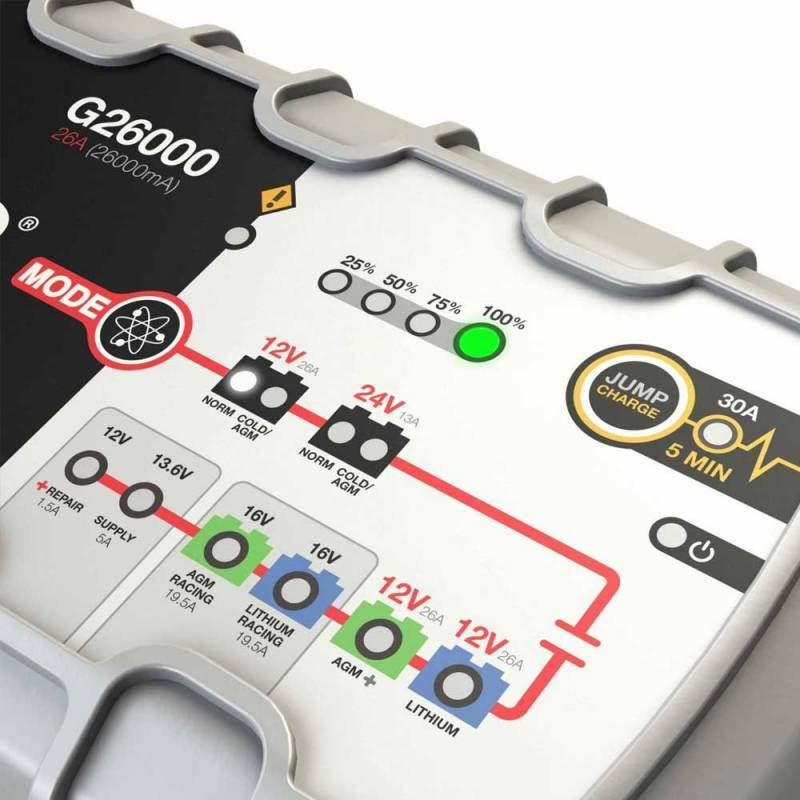 The G1100 is capable of maintaining large applications and is a great economical solution to extending the life of your batteries if full recharging isn't required. JumpCharge is an innovative new feature for jump starting low-voltage or dead vehicle batteries. The JumpCharge process is much different than a traditional battery charger with an “engine start” feature. JumpCharge uses precision charge control to avoid overloading the battery which could shorten the life of the battery. All of the Genius Chargers were designed with the user in mind. 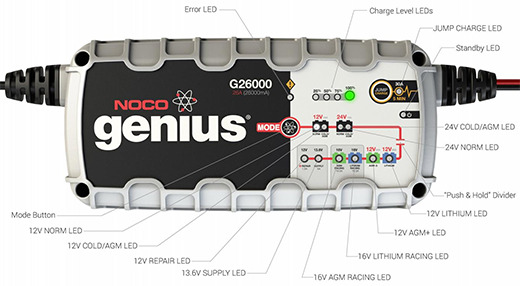 The simple interface allows for mode changing at the press of a button, while the LEDs inside share the status of the charging process. At the same time, the UltraSafe technology inside will help ensure safe charging by minimizing any chance of damage to either you or your car battery. Plug-in, set and forget. The versatility and genius behind our chargers is its ability to charge a variety of battery technologies and applications. 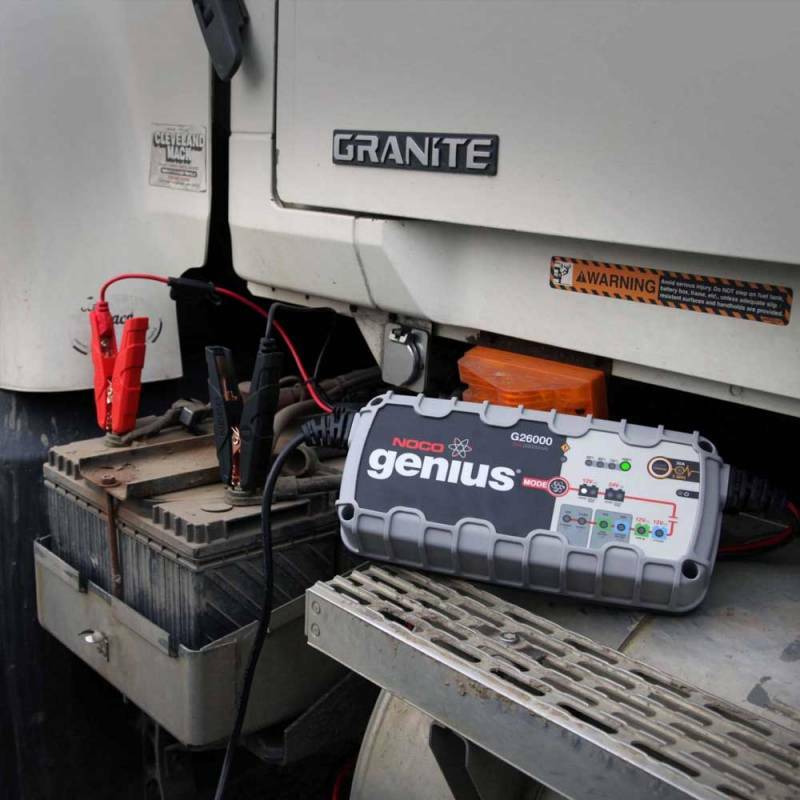 From automotive, marine, powersport, lawn and garden to deep-cycle batteries, our chargers are engineered to replenish lost capacity in just about any vehicle or equipment. It’s suitable for popular battery chemistries such as wet cell, gel cell and enhanced flooded battery for micro-hybrid start-stop vehicles. Remembers the last charge mode when accidentally unplugged or loses power. So you'll never come back to a dead battery, again. 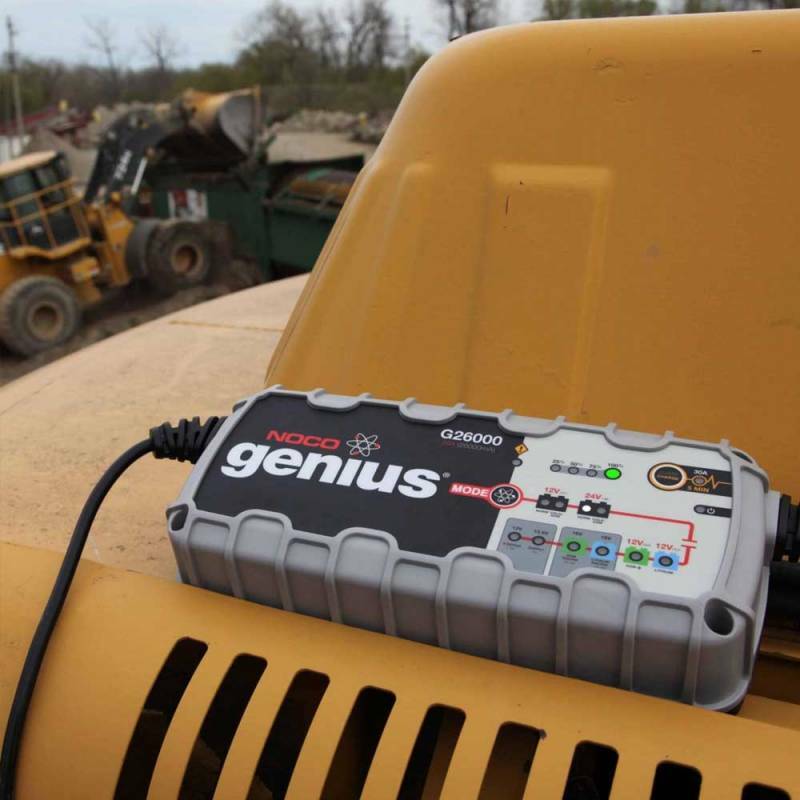 With an IP rating of 44, it's water, shock, dirt and dust-proof. And it can easily survive a drop or be run over by a vehicle. We're big fans of safety. 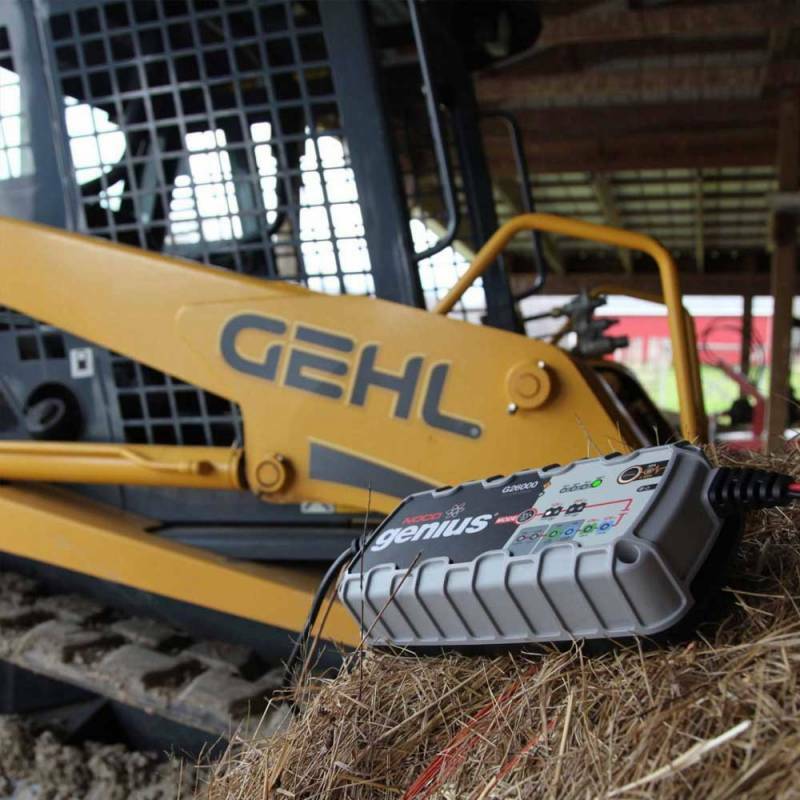 So we built-in redundant levels of safety protection, and automatically detect abnormal charging conditions. Our products are designed to last. That's why we back it up with an unbeatable warranty and combine it with unparalleled customer service.